It seems that once your kids get past first or second grade, learning becomes a lot less hands-on, especially with math. Of course, part of the reason is that things just get harder and so much of it involves putting pencil to paper. Take three digit addition for example. It takes a lot of loose parts to find 356 + 729, not to mention, it’s way too time consuming. Can you imagine? It’s not impossible, though, to make things a bit more interesting. There’s no need to work an endless page of addition problems, when you can grab a set of playing cards and get the same amount of practice. 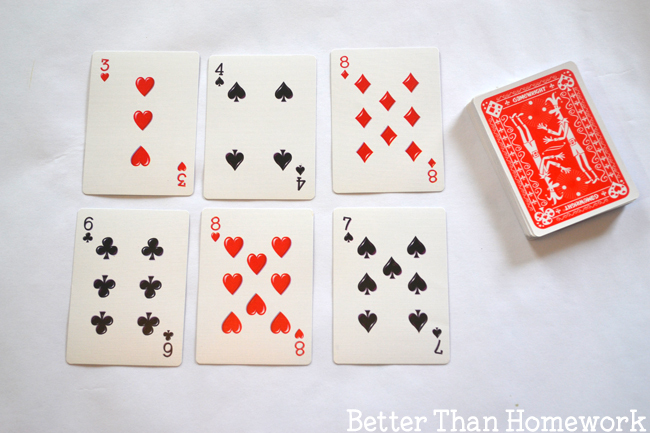 First, you’ll need a deck of playing cards with the Kings, Queens, Jacks, and Jokers removed. Shuffle the cards and lay them face down in a pile. You’ll also need a paper and pencil. Instead of solving three-digit addition problems on a worksheet, we’re going to use our playing cards to find our math problems. Draw three cards and lay them out next to each other. Then, draw three more cards. 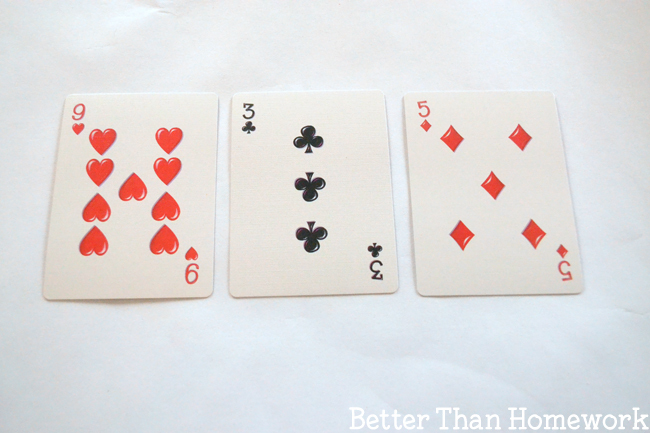 Lay them out underneath the first three cards. Now we’ve got our two different three digit numbers. For example, in the photo below, we have the numbers 348 and 687. Use the paper and pencil to solve the addition problem. Keep drawing cards to work several more three digit addition problems. 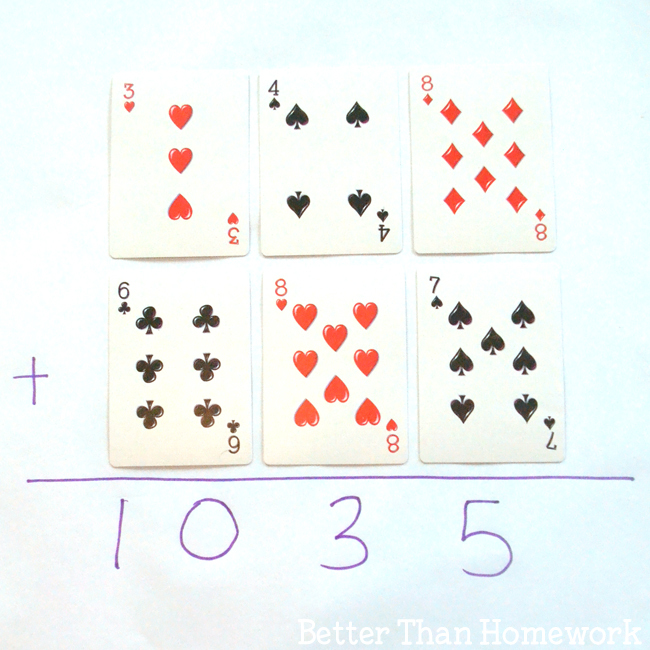 When doing this three digit addition activity, you need to keep in mind you child’s level in math. If they haven’t learned regrouping yet, you will need to control the cards. 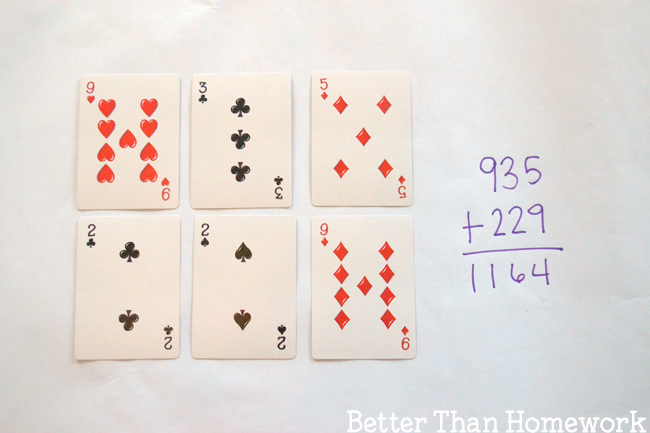 Instead of randomly drawing cards, lay out a few addition problems instead. Is your child still working on two digit addition? Just draw two cards for each number. Or maybe they’re already up to four digit addition. Just draw the amount of cards you need. Test your answers with subtraction. Subtract one of your numbers from the total to see if you solved your addition problem correctly. Work in pairs. Each child would draw their own set of cards (6 in total) and solve the problem. Who has the biggest total? Who has the smallest total. Do you have any fun variations to try? 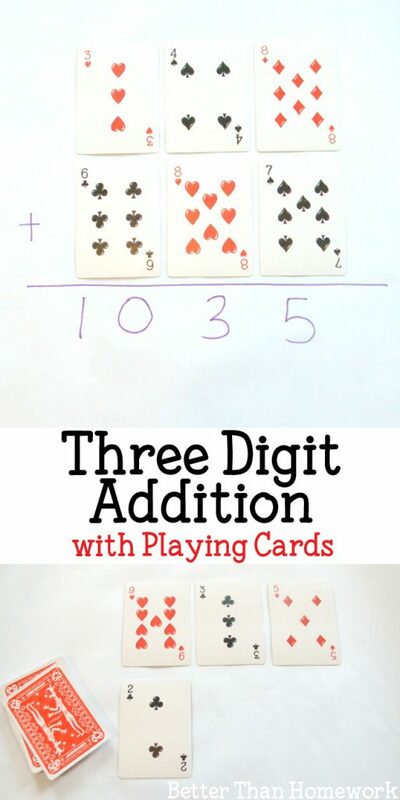 If you enjoyed this three digit addition activity, the above photo is perfect for sharing on Facebook. Or you can save the photo below on Pinterest.